“Just the book I need! Now I am able to support my colleagues who have heard of the Maker Movement and 3D printing but just didn’t know how to get started in their classrooms. The Invent to Learn Guide to 3D Printing in the Classroom: Recipes for Success is both inspirational and practical. We want our students to become designers, tinkerers and creators – but sometimes we just need that little bit of extra guidance – a jumping off point. That’s what I truly appreciate about this guide. Although the authors readily admit they are not ‘huge fans of recipes’—they indeed encourage and support students to use each project as inspiration to tinker, inquire, learn from their errors, and to take pride in their creations. I’m delighted that the book begins with a comprehensive overview of the hardware, software, principles of design and, of course, the curriculum standards. 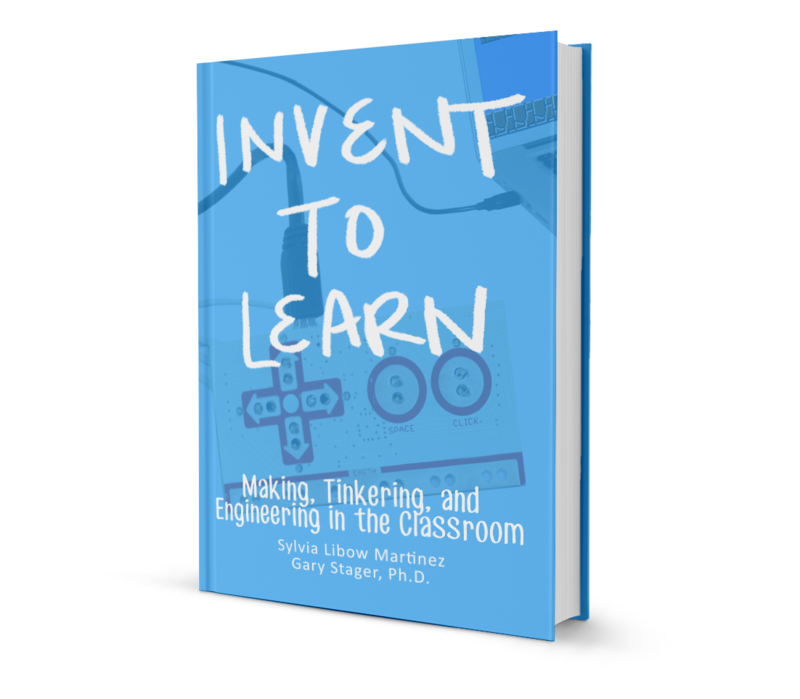 This lays the groundwork before the authors provide detailed instructions for projects that suit a variety of student interests—from backpack tags to fan powered cars to printing your own fossils! Another delightful reality—supported throughout this book—is that students are not just ‘doing’ mathematics and science, they are actively engaged as mathematicians and scientists in their own right. As such, when they encounter difficulties, they need to tiptoe back through their thinking by revisiting their designs and seeing what bugs in their processes they need to fix. David, Norma and Sara—you’ve done it again! You are providing leading edge support, creativity and a ’way of being’ to teachers to do this most important work with our students. “An outstanding overview and guide to the use of 3D printers in schools. More importantly it is a passport for learners to excitement and engagement, while offering students and teachers an alternative to the boredom that so often pervades our schools.”– Ray Trotter, Principal, Wooranna Park Primary School, Melbourne, Australia. “If you are a teacher or parent getting your first 3D printer, this book is a must-have addition to the tools you will need. The only problem with a 3D printer is that it can do almost anything, and a tool that does so much can be a little intimidating at first. Many people will tell you to go download things from the internet to print on your 3D printer, but as someone who has had a couple 3D printers, I’m going to tell you that the “bright and shiny” aspect of printing someone else’s designs will wear off eventually. When that happens, go find this book on your shelf, and get ready to start having some real fun because 3D printing isn’t about having a replicator it’s about having a idea maker! This new book by David Thornburg and his cohorts is an excellent resource for any teacher, homeschooling parent, or curious student interested in learning how to start making their own designs on a 3D printer. In this book you’ll find recipes that are easy to follow if you’ve never created a 3D design before. You’ll learn where to find excellent free design tools, and there are enough cool projects to keep you busy for several weeks or even months. It won’t be long before you start taking the ideas you learn in the book to start making your own ideas, and that’s when the real fun begins! For the teacher, this book also has resources in the front that discuss the connection between the standards (Common Core and NGSS) and 3D printing. Each project also has a section in the beginning that discusses the specific standards addressed by the project. This is truly the best resource currently available for any teacher wanting to start 3D printing in their classroom or library.